Here's the first of three official PPC scenarios for use with the PPC Comp and its army lists. Consider this scenario a draft, and please comment on anything you feel need to change. Place one round 12cm objective zone (the size of a DVD disc) at the exact center of the battlefield. Place four more objective zones in each direction, 18” and 12” away from the center one as shown below. Don’t mind the different colours of the objective zones for now. if the dice shows a result of 1-3, the battle ends. 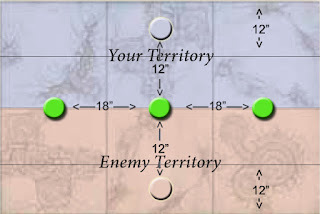 Count any victory points as described in the scenario played. To hold a zone, there must be at least one of your models completely inside it, and no enemy models completely inside it. A unit can only ever hold one zone at the same time. 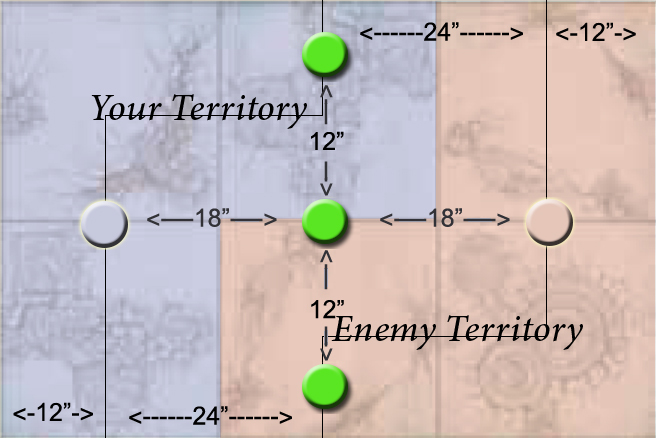 The three middle objective zones (marked green in the pictures) are each worth 6 victory points if you hold it at the end of the game. 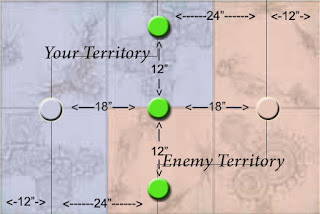 The blue objective zone is worth 3 victory points to the blue player, but 9 victory points if held by the enemy. Likewise, the red objective zone is worth 3 victory points to the red player, but 9 victory points to the enemy. If you hold the enemy objective zone (i.e. the red zone for the blue player or the blue zone for the red player) at the end of the game, you gain 1 Tie Breaker Point. Thanks for letting me know, should be fixed now! That's odd, they are showing fine for me even when I am not logged in on my account. Could you try and reload the page in your browser, maybe its stuck in a cache page or something. Please let me know how it went. I cleaned up the caché before trying and writing the post and it didnt work, but now doing nothing is working... Soo weird, but fine now.